Cal2Tsk transfers near future Calendar events to Tasks. It would be useful if you don't want to see all future TODOs from Tasks. For example, if you just got a good idea for someone's birthday, but his birthday is 9 months later. You cannot do anything about it until few days before the date. There can be several solutions for this issue. You may use the "Unfiled" category in Tasks, but what if you already use this category for another purpose? Create an event on the due date in Calendar and forget about it. 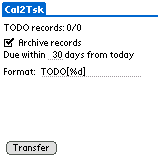 Just transfer periodically TODO records to Tasks. Cal2Tsk is very similar to Tsk2Cal, but it's the opposite direction. You can set alarm for untimed/timed events and these alarm settings will be also transferred. Untimed events: Use "Days" option for alarm and Cal2Tsk will set alarm time to 12:00 pm. Timed events: Use "Days" option for alarm and Cal2Tsk will use its start time for alarm setting. Cal2Tsk is freeware. USE IT AT YOUR OWN RISK! Wed Apr 3 01:40:24 2019 . XHTML . CSS (lightbox.css is not part of Uniqki. ;-) . Powered by Uniqki!